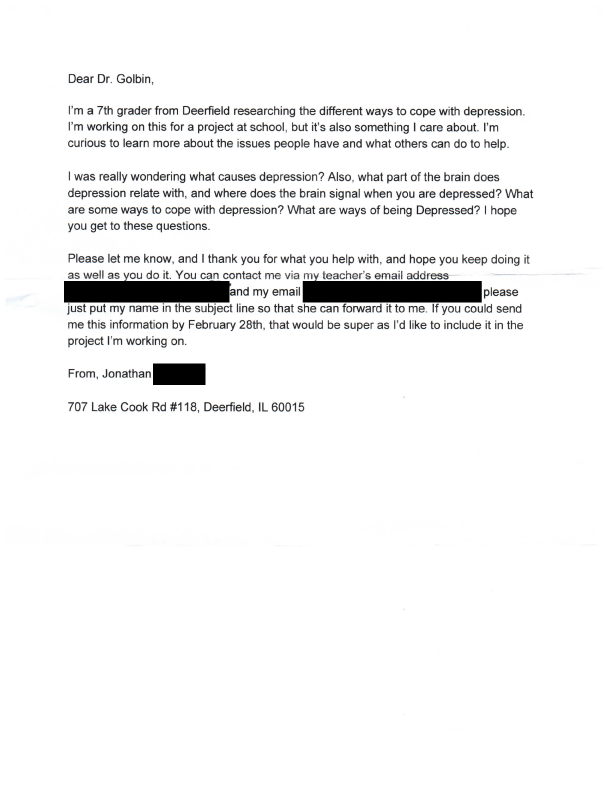 Recently, we received a letter from a 7th-grade student, that was working on a project about depression, coping with depression and the potential causes. Below you can read the original letter from Jonathan and Dr. Alexander Golbins response. Thank you for your inquiry about Depression. It was a great pleasure for me to receive a letter from a young researcher and it is my honor to make an attempt and explain in clear terms such a complex and complicated subject as Depression. Scientific understanding of “depression” is very different from the public use of the label “depression”. Scientific (and medical) term “depression” is very narrow and very specific. Depressive disorder should include at least 5 out of 9 specific symptoms during the same 2 weeks period. Two symptoms are mandatory- depressed mood and loss of interest and/or pleasure. Those symptoms should be so severe that cause significant distress and impairment in most aspects of life including family, work, learning, and relationships. This condition should also not be due to acute medical illness or drugs. It is important to differentiate if depression is triggered by external psychological traumas or if it appeared spontaneously due to internal brain/body turbulence. There are many types and subtypes of depressive episodes and depressive disorders. These different types should be treated very differently from each other. Biological depressive disorders might be cyclical, periodic or chronic; dependent from the endocrine fluctuations, the weather, anniversaries, and other predictable triggers, but other types may be chaotic and unpredictable. Please, keep in mind that depressive disorders, especially in young population are not only “brain disorders” as media presented them, but whole body SYSTEMIC disorder. It simply means that the “cause” or the “trigger” of the depression might be the loss or too much sleep, significant weight loss or gain, headaches, chronic fatigue or autoimmune issues. Depression is a sleep disorder because all of our body’s “software” and metabolism are programmed during sleep. Depression might start as a very mild and benign physical or psychological symptom –insomnia or hypersomnia, temperature, pain or anxiety,- then get “stuck” as a “habit” and eventually develop to a full blown disorder. It also may start as a “personality problem” – impulsivity, anger (in teens) and anxiety. The main point: do not blame serotonin, dopamine and a hundred of other brain neurotransmitters and hormones. They are just mechanisms of actions, like chains and tires in the machine, not a cause. Always think about the person as a whole. The brain is not depressed- the Person is depressed. In terms of the brain mechanisms for depression it is the Disorder (means “out of order” ), dis-coordination between the old emotional (called limbic) centers which are overactive (we call it “over-firing”) and cortical frontal lobes, especially in the left brain, that “ misinterpret” emotions as a catastrophic situation inducing a sense of “emotional pain” and “impending doom”. Recent scientific brain studies discovered that the “movement coordination brain” called cerebellum has a great role in coordination of thinking centers and impulsive behavior (including impulsive suicide) in depression. The treatment of depression is tricky but very productive especially if it’s recognized early. The problem is that most depressed teens feel anxious and deny being depressed because they are afraid of the label “psycho” and they try to self-treat with alcohol, drugs or aggressive outbursts toward themselves (self -cutting) or towards others, especially family members. It is important to underline in your research that the treatment of depression is not always through drugs but also by learning stress management techniques from professionals. Specifically point out that mild form of short episodes of depressive mood are normal and even helpful for the body and brain protecting them from the “storm and fire” of the organism during stress. Please emphasize, that “depressed” teens are usually the smartest, more sensitive, and with a rich internal psychological world, frequently overwhelming. Thank you for your interest in learning about depression and your mission to spread the scientific knowledge instead of incriminating labels and ”bad reputation” preventing young people from getting an “emotional toilet training” and emotional ” toughness training” before the depressive disorder becomes a real problem. Good luck with your research and your life.